Linked Pop Up Display Stands are one of the most popular and best-selling exhibition stand products on the market. So, what is a linked pop-up stand? A pop-up stand is a portable exhibition stand that is used to display your corporate message or to advertise at exhibitions, trade fairs, conferences and anywhere else you want to promote your business. An l-shaped pop up stand is one of the easiest displays to transport due to their versatile design. Once they are assembled, they can create a self-contained area ready for business. What is a Linked pop up stand? Linked Pop Up Stands are an ideal display solution for creating a booth in your exhibition stand space or corner shell scheme. They are a cost-effective way of creating large scale exhibition stands. 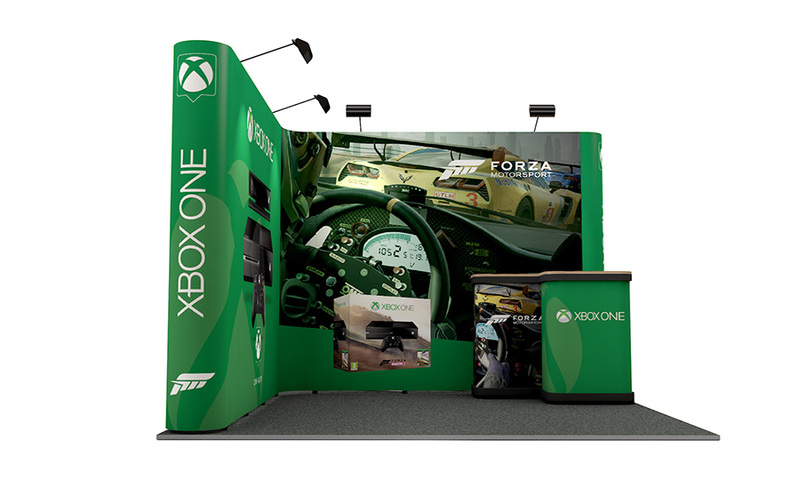 Linked pop up stands are very easy to use and are set up in the same way as a standard pop up but with ghost graphic panels to join the frames together. A clever and creative design will mean that your visitors will not believe your display consists purely of pop up stands,which creates a fabulous, sophisticated display at your exhibition or trade show. Why Choose a Linked Pop Up? 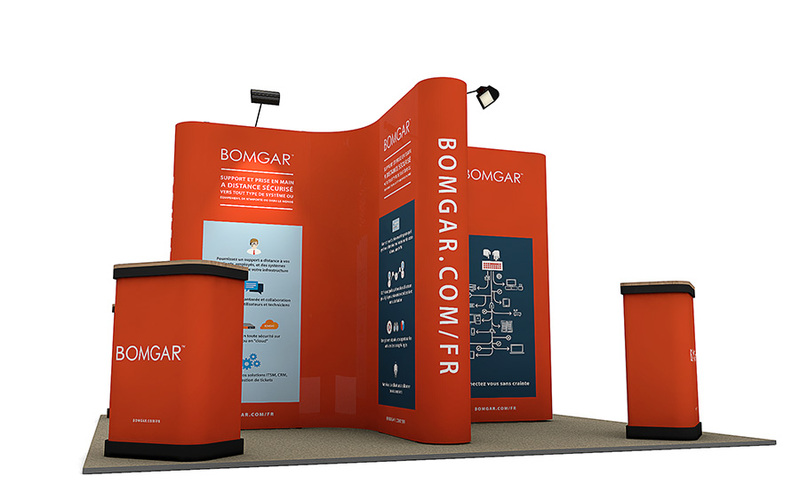 The configuration of linked pop-up stands can be any shape you choose, so if your graphics are large, you are able to link the stands together to create one continuous graphic backdrop for an impressive display. The ability to manipulate your existing exhibition stand to suit multiple floor spaces is a huge benefit; not only for ease of use but also for saving money in the long run. Linked pop up stands not only offer you the choice of reusing hardware, they also allow you to replace your old graphics with new ones if your marketing message changes. The complete L-Shaped Pop Up Stand packs away into the supplied Zeus transport cases, regardless of size, making the stand easy to store and pack away ready for your next event. All hardware is included within the price – cases, LED lights, wooden podium conversion tops, graphic podium wraps, hardware and printed graphics. A very popular design is the ‘U’ shape linked pop up, where three linked panels can be used to create a cosy space for your visitors to ‘pop in’, take a seat and discuss business with you. 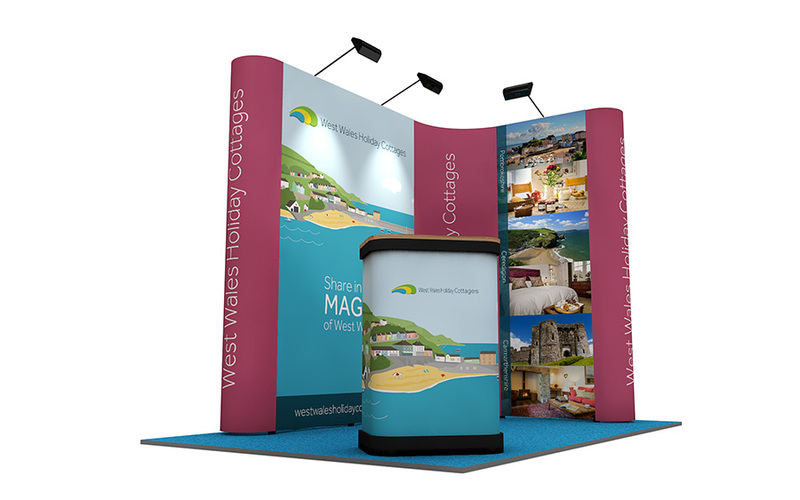 A popular size in this configuration is the 2m x 3m U-Shaped Pop Up as it is an ideal choice for first time exhibitors. It is also ideal for businesses that are looking to upgrade from smaller exhibition displays to make more of an impact at events. The 2m x 3m exhibition stand is made up of two 3x1 pop up frames and one 3x2 straight pop up frame with linking panels and two ‘D’ end panels for a professional u-shaped exhibition stand. This kit also comes with 3 portable, wheeled carry cases with graphic wraps and counter tops which can be used to store your pop up when not in use. Four LED lights are also included that help to illuminate your artwork and exhibition stand. 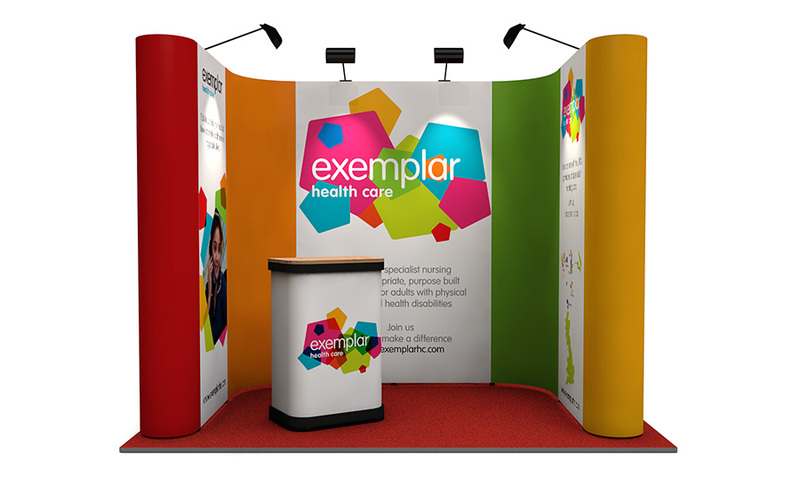 L-shaped pop up stands are a popular choice for businesses looking for a versatile, user friendly and attractive display. The linking panels which join the pop up stands together create a large format backdrop which can be used in either a left hand, right hand or back wall configuration, giving your business room to change alongside marketing needs. Although the L-Shaped pop up can be purchased in many different sizes, the most popular style has got to be the 3m by 3m L-shaped Pop Up exhibition stand. It is an impressive pop up exhibition display that is a popular choice for both new and established exhibitors. Two 3x3 pop up stands are linked together to create a seamless artwork display with a 90° bend, creating the L-shaped linked pop up. Pop Up islands are uniquely designed as a display island in a cross shape. This provides visitors with a 360° view of your stand, ensuring your brand gets maximum visibility. One of our most popular pop up islands is the 4m x 4m linked Pop Up system. This linked pop up system fits into a square 4m x 4m exhibition space and is ideal for businesses looking to upgrade their current exhibition display to a more permanent solution that can grow alongside their business. This display is made up of four 3x1 pop up displays linked together with linking panels and finished with ‘D’ end panels to hide the frame for a professional, seamless appearance. Also included with this exhibition stand are four portable carry cases with graphic wraps and beech counter tops which can be used as promotional counters or for product display. Four LED lights are also included which help to illuminate your exhibition stand and make your artwork stand out. This stand is ideal for larger businesses that are looking to upgrade their current exhibition solution to a more impressive, eye-catching display that will help to boost event performance. 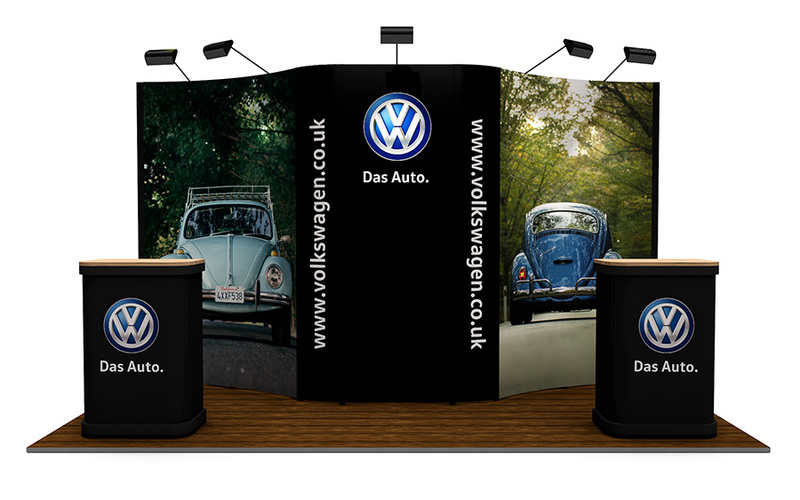 Our most popular straight back wall is our 2m x 4m Pop Up Exhibition stand. This linked pop up exhibition stand is suitable for a 2m x 4m exhibition space and is a great choice for all types of exhibitors. It is also ideal for businesses that are looking to upgrade their display to a more striking exhibition stand. The 2m x 4m linked pop up system is made up of a 3x1 pop up frame and two 3x2 curved pop up frames, joined together with linking graphic panels to create a professional exhibition back wall. Also included with this system are three portable carry cases with graphic wraps and beech counter tops which are ideal for use as a meet and greet point for visitors on your stand. Five LED lights are included which help to illuminate your exhibition stand and make your artwork stand out. To complement our pop up stands we offer a wide range of pop up accessories. Accessories are a great way to enhance your exhibition stand and add the finishing touches. An internal shelf can be added – This shelf unit will hold upto 10kgs, evenely distributed, so you can use it to display your product. Add a monitor bracket which allows you to attach a TV or monitor directly to the pop up frame. Ideal for playing a presentation. Our XL 60 Free Standing TV Stand can be integrated behind the graphics of your pop up or it can be used as a seperate TV stand elsewhere on your exhibition staand. mIt is suitable for use with TV's or monitors upto 60 inch. The pop up counter works in a very similar way to the pop up display. It features a pop up frame,wrap-around graphic and a counter top. It creates a meet and greet counter or reception area for your exhibition stand. Why Buy Pop Up Stands from XL Displays? Ensuring our customers receive the best value for money, we now include LED Lights as standard with all pop up stands. Providing a low cost lighting solution, these LED lights link upto two using one power cable, minimising the number of sockets and power required for exhibitions and events. The LED’s will also help illuminate your display to help emphasise your graphics. We also offer a professional, in-house, exhibition stand graphic design service. Don’t worry if you don’t have artwork or need your current artwork amending - our graphic design team can help. If you do wish to provide your own artwork, one of our graphic designers with check it thoroughly to ensure it will result in the best possible print. With over 20 years of experience in the exhibition industry we are the experts to talk to. Our sales team will help with any enquiries you have and can help find a display solution which works best for your business. Don’t take our word for it, find out what our customers think of us on independent review site Trustpilot. For more information about our Linked Pop Up Stands, please contact us or call 01733 511030.